DEVELOPING STORY: Dust storms have hit Karachi as of May 19 at about 7:12 pm PKT, the dust storm was generated by same storm that wrecked havoc in Sindh earlier in the afternoon. Chances of drizzle/isolated showers in Karachi till night as a thunderstorm is passing through the north-western Sindh although its intensity is decreasing. Wind speed has dropped to 36 km/h. The highest wind speed reached 72 km/h. One woman died, four injured due to the dusty winds in Karachi. The storm has now started to show signs of weakening especially the northern part as it moves eastwards. 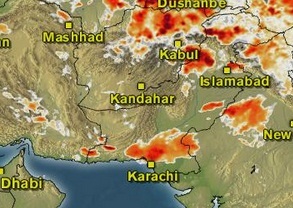 The thunderstorm over northern Sindh as further weakened as it moves into Gujarat however there is a cloud presence over Karachi but they are mostly weak and are expected to move away.